Messner and Karow earn first career weekly awards, Ruzicka wins Goaltender of the Week for the third time this season. The United States Hockey League announced the CCM Forward, Defenseman and Goaltender of the Week for Week 21 of the 2016-17 season. 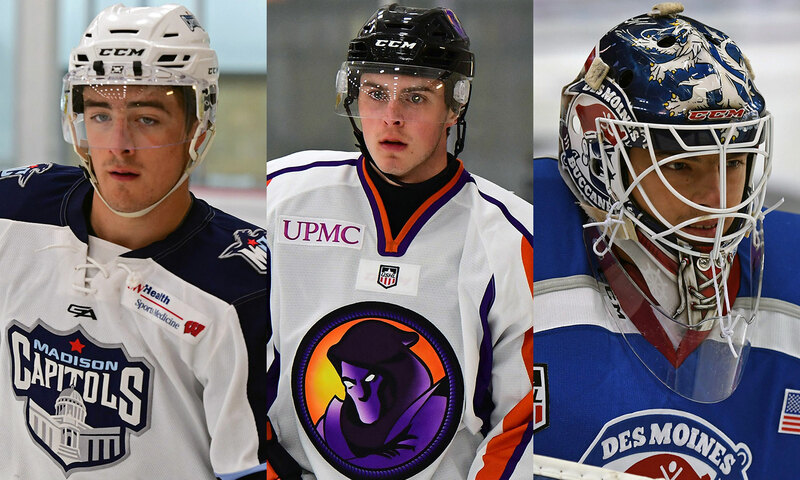 Madison Capitols forward Mick Messner and Youngstown Phantoms defenseman Michael Karow were named Forward and Defenseman of the Week, respectively, for the first time in their career, while Des Moines goaltender Jan Ruzicka earned Goaltender of the Week honors for the third time this season. Messner finished the weekend with three goals and an assist, including two overtime game winners and a primary assist on another overtime winner. Karow dished out four assists and was a +4 in the Phantoms' sweep of the Bloomington Thunder. Ruzicka finished last week with a perfect 2-0-0-0 record and 60 saves, including a 30-save shutout on Saturday in Muskegon. CCM Hockey is the official equipment provider of the USHL. Messner tallied the game-winning goal in overtime on Friday against Cedar Rapids and did the same thing on Saturday against Dubuque, finishing with two goals in a win over the Fighting Saints. He added his fourth and final point of the weekend on Sunday in Dubuque, dishing out the primary assist on the overtime-winning goal in the Captiols' third overtime win in as many games. The Madison native is now sporting a five-game point streak, with six points (4G, 2A) in that span. He has 19 points (10G, 9A) in 37 games this season, good for fourth on the team in scoring. 2016-17 has been a year of accolades and accomplishments for Messner. Earlier this season, the University of Wisconsin commit was named to the USA Hockey Ivan Hlinka Team, the USA Hockey CCM/All-American Prospects Game, the NHL Central Scouting Players to Watch List, the U.S. Junior Select Team for the World Junior A Challenge, and the USHL/NHL Top Prospects Game. He tallied an assist in the CCM/USA Hockey All-American Prospects Game and won a gold medal with Team USA at the World Junior A Challenge. Prior to his time in the USHL, Messner played for the Madison Capitols 18U (NAPHL) program as well as Madison West High (USHS). He was the fifth overall pick by the Capitols in the 2015 USHL Phase I Draft. Karow dished out four assists over the weekend, including three primary helpers. Three of those assists came in a 4-3 victory over the Bloomington Thunder on Thursday, with Karow tallying a helper on the game-winning goal with just 21 seconds remaining in the contest. His fourth assist on the weekend came on Friday in the Phantoms 5-1 victory and weekend sweep of the Thunder in Bloomington. The Boston College commit now has 16 points (1G, 15A) in 41 games this season, including six assists in his last three games, good for second among Youngstown defensemen, with his 15 assists ranking first among Phantoms blueliners. His 16 points rank third among USHL rookie defensemen. A native of Green Bay, WI, Karow was ranked 117th among North American skaters on NHL Central Scouting's Midterm Rankings and also participated in the USHL/NHL Top Prospects Game in January. He was a seventh round selection, 110th overall by Youngstown in the 2016 USHL Phase II Draft and previously played for Notre Dame Academy (USHS), Team Wisconsin (USHS) and Green Bay United (USHS). Ruzicka made 30 saves on 31 shots in a 4-1 Des Moines victory in Cedar Rapids on Thursday before stopping all 30 shots he faced in his team's 2-0 road victory in Muskegon on Saturday night. The Czech netminder now sports a record of 16-8-0-4 on the season with four shutouts and currently sits with a 2.10 GAA and .923 SV%. His four shutouts are tied for the most in the league, and both his GAA and SV% rank fourth among all USHL netminders. This is Ruzicka's third weekly award of the season, as he was previously named USHL Goaltender of the Week on both Oct. 10 and Jan. 2. He is in his second USHL season and has a career 2.81 GAA and .905 SV%, along with 28 career victories between the pipes. Ruzicka was a third round pick, 47th overall by Des Moines in the 2015 USHL Phase II Draft and previously played for BK Mlada Boleslav (Czech Republic).